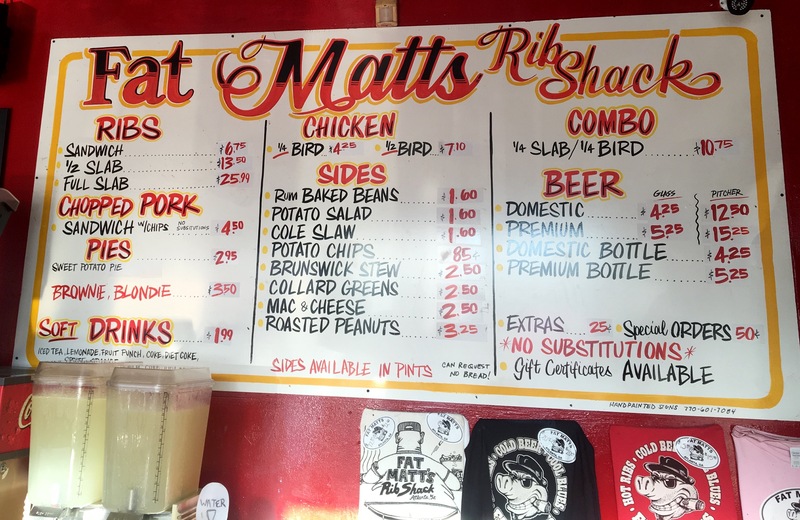 “If you wear a tie, please loosen the knot before entering.” So begins a sentence on the Fat Matt’s Rib Shack website. Date Night never wears ties, so we don’t have to worry about that. 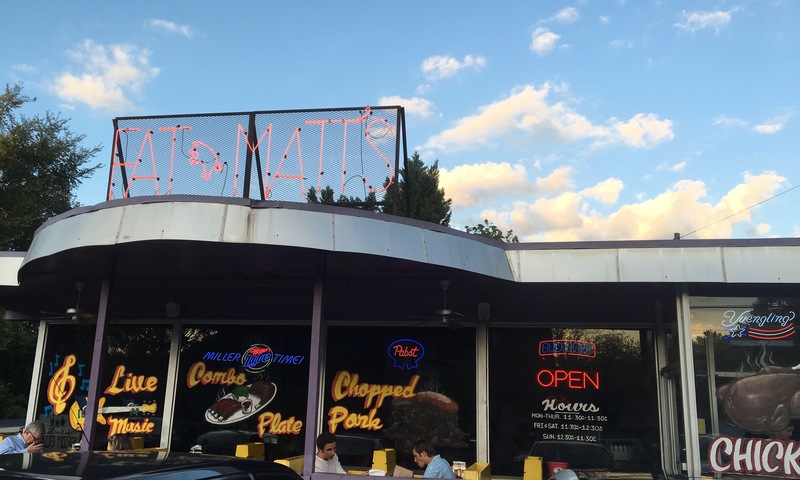 However, we should be worried that Fat Matt’s has been around since 1990 and we have never visited. 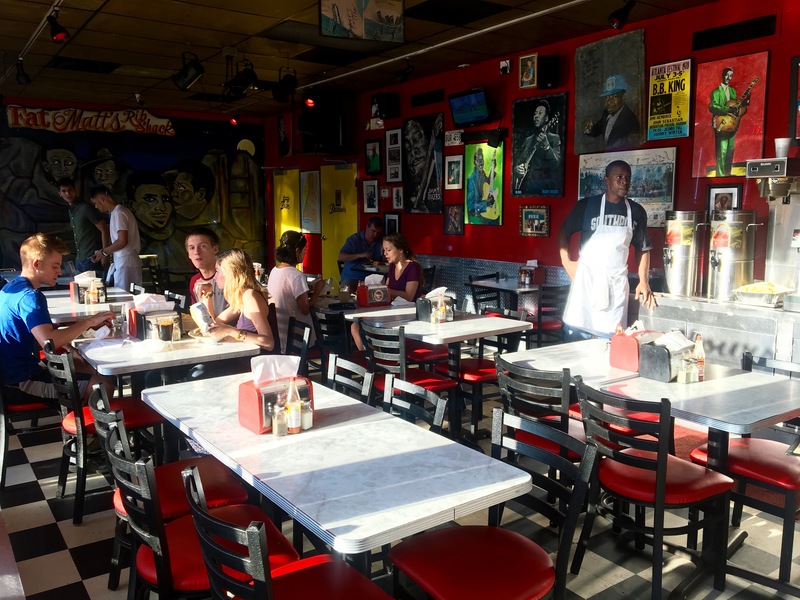 The reigning Atlanta “Baron of Barbecue”, Grant Goggans, has moved to Chattanooga, so someone has to keep an eye on the ATL barbecue scene in his absence. This week, that’s us. Let’s go inside and see what’s smokin’. 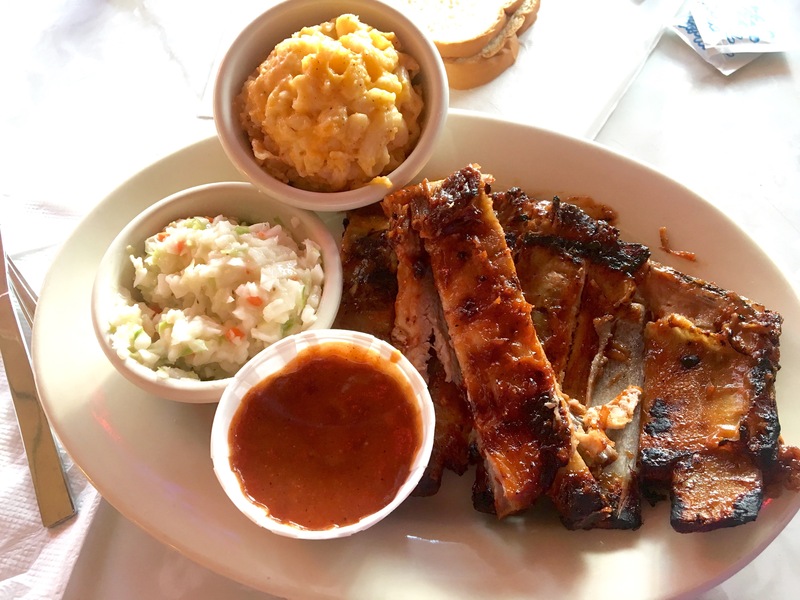 The menu is simple: ribs, chicken, and pork. That’s it. It’s pretty easy to decide here. It’s not called “Fat Matt’s Chicken Coop”, or “Fat Matt’s Pulled Pork Pen”. There is a reason why the “ribs” are in the name. You stand in line to order and the helpful and attentive staff brings your food, drinks, refills and anything else you may need. There is a line for the entire time we are here. It moves fast, and although indoor seating is limited (you can sit outside if it ever cools off), nobody has to wait for a table. Look at these gorgeous ribs. They are meaty, but not fatty. Fat Matt must eat a lot of them. In fact, I could eat a ton of them. They are that good. Although extra sauce is brought with the order, it’s not needed. Everything about these ribs is perfect. They are some of the best that Date Night has eaten. We should probably mention the sides. There’s a lot of love in the mac and cheese. It must be somebody’s grandmother’s recipe. No Velveeta mess here–the cheese sticks perfectly to the elbow noodles. It’s excellent too. There’s nothing exceptional about the slaw. We just wanted to order something with a little vegetable in it. 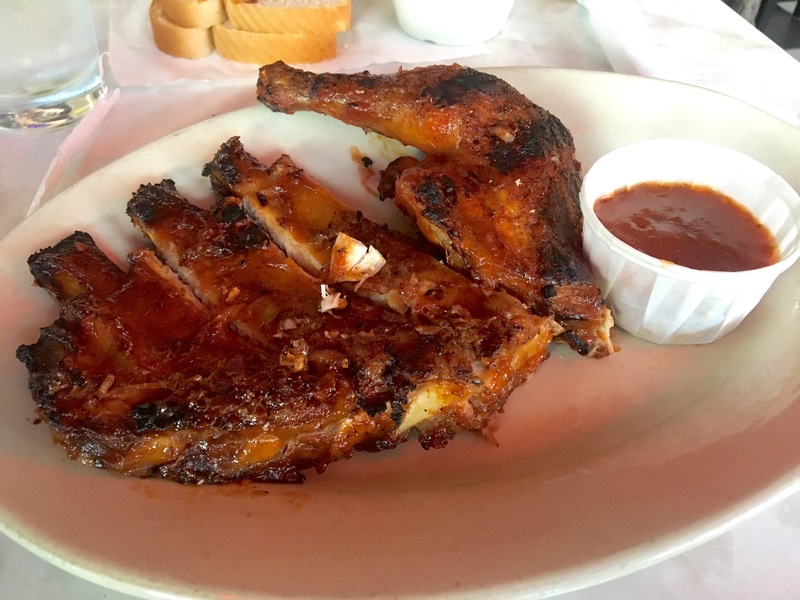 I do want to taste the chicken, so I get a combo with a quarter chicken and…more ribs! Before we get to the chicken, I should mention the two slices of unloved white bread that come with the meal. We find out later that we could have ordered everything without the white bread and saved the waste. Oh, well. Meanwhile, back at the chicken, the fowl is moist and tender and tastes as good as the ribs. It is an excellent alternative for those who don’t like pork. But if you don’t like pork, what are you doing here in the first place? Maybe you are coming for the sweet potato pie. 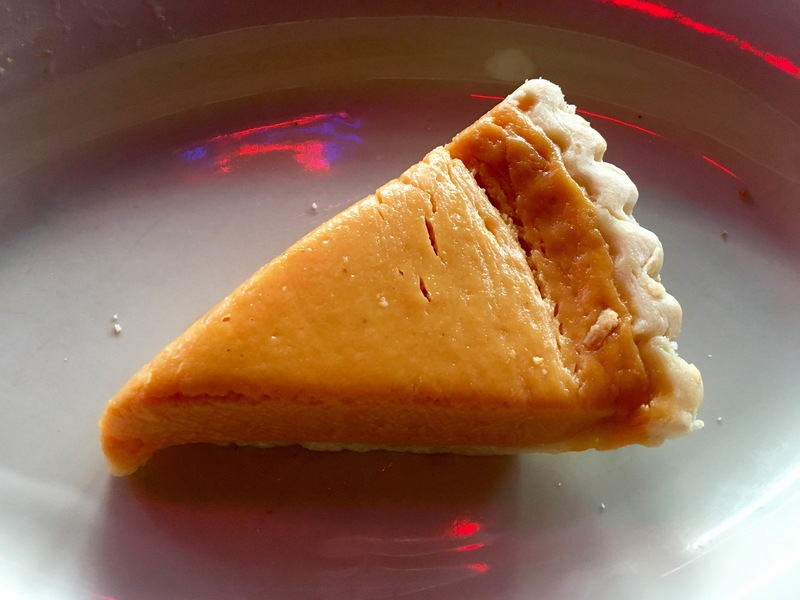 It’s not too sweet, and you can taste the yams in it. We’ll bet that Matt’s grandmother used to make this dish too. 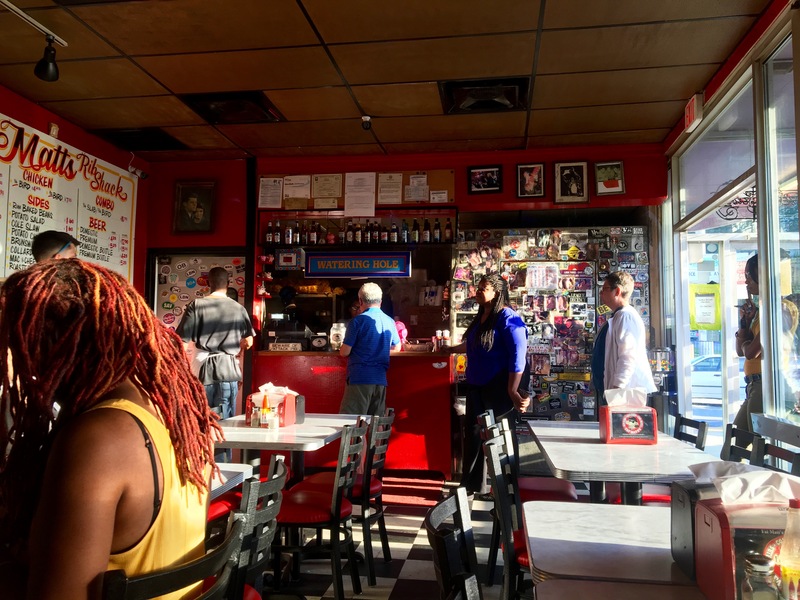 The bottom line on Fat Matt’s Rib Shack: Absolutely excellent. We have had bad dinner experiences at BBQ places as sometimes the food is dried out because it has been sitting all day. Not so at Fat Matt’s. They sell so many ribs that they have to keep making them fresh, and you will taste the difference. As an added bonus, there’s a blues band almost every night. We sat and waited for the band to start, but they were more interested in drinking beer than playing the blues, so we let someone have our table. It only took us 26 years to try the place. It won’t take that long before we come back. Thanks for the shout-out! We, ah, we could do with some ribs as good as Fat Matt’s in Chattanooga, he said, trying to sound even-handed. Actually, about ten years ago, they used one of the adjacent buildings for Fat Matt’s Chicken Coop, just doing the fried chicken there, and it was terrific. Parking was even more of a pain in the rear when that was open, though. 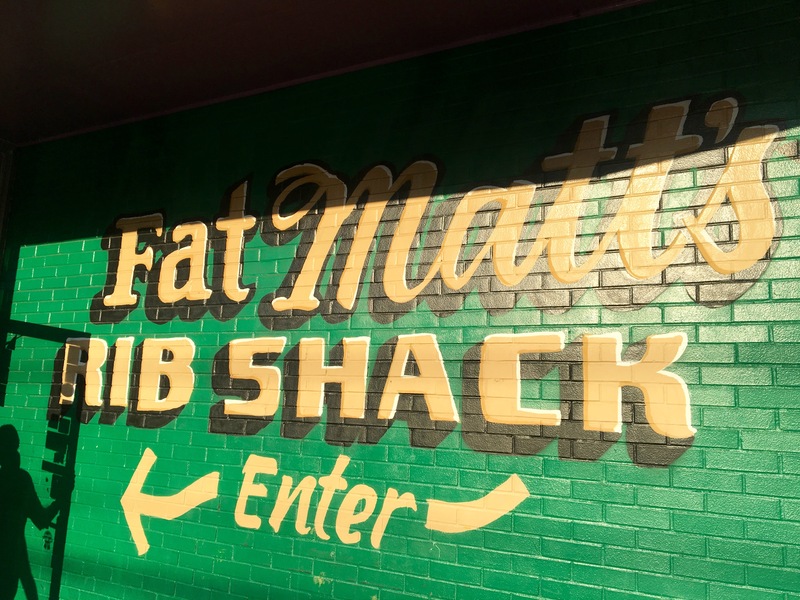 Fat Matt’s ribs are really good, one of my favorites in town. One Star Ranch closed recently but they were my overall favorite. Sam’s BBQ has an amazing beef rib. But the main reason I’m writing is to say thanks for giving this place a good review. There are so many BBQ snobs in this town that just hate it for some reason, but Fat Matt’s crowds are genuine. It’s great to see something positive about it. Agree with you totally, Alex. Thanks for the comment and for reading the blog!